Friends, it is so cold outside right now. I found myself scrolling through more wintery photos as I was trying to narrow down the choices for the Dye Along, and I found myself wanting to play with yellow. I want to sit on the beach, think of fresh tart beverages and warm my bones in the sunshine. (I am REALLY cold right now as I'm writing this!) I have no idea what made this one lemon pink, but I want to try to make a summery, happy yarn in bright yellow with pops of pink or other neon colors. Join me on Thursday 1/18/19 at 8:00 PM EST to watch me dye some yarn inspired by this photo! If you can't join me live, you can always watch the replay later. These dye alongs are so much fun. I love interacting with all of you while I'm dyeing yarn and challenging myself to pinpoint my inspiration. However, I think the best part is seeing what all of you create from this photo inspiration. You can be as literal with your inspiration as you want. You can be inspired by the colors, shapes, objects. You can dye yarn, knit with colorwork, dye fabric, or even blend your own fiber. 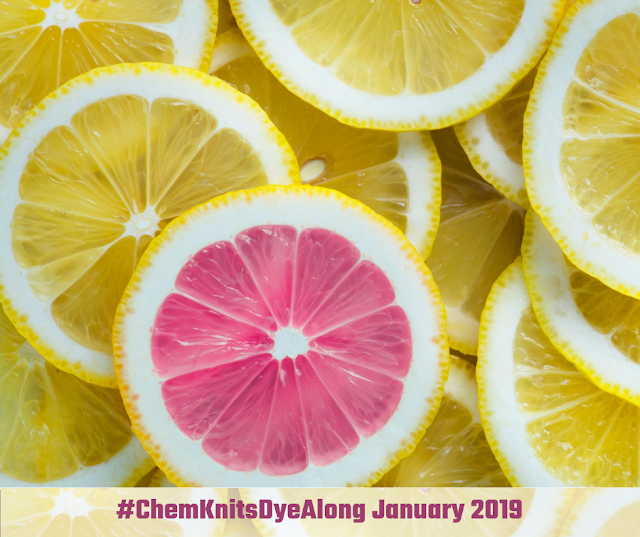 Let me know how your project was inspired by this photo with the hashtag #ChemKnitsDyeAlong on Instagram or by posting on the inspiration photo thread on the ChemKnits Facebook Page. I will pick some of the submissions to feature in my livestream recap at the beginning of February. Make sure you let me know how you were inspired by this photo. I love hearing how you decided to create your yarn.